Calista, being the pioneering brand of this 21st century, has launched several rollers for every hair type and length. The brand has captivated the hot roller zone with radical technologies and phenomenal features. In this war of “Best Hot Rollers,” there also remains a handful of products that flopped in the market. Calista MagicStylers Heated Rollers are one of those models by this brand that failed in the race. Calista MagicStylers has 14 rollers which may sound an advantage but all the rollers are of the same size. You will not be able to create different curls on your hair. Multi-textured curls are not possible by this hot roller set. If you want only you selected curls then you can go for this but you cannot make different curls and volume your hair by this. The hot rollers by Calista have two different heat settings so that you can select the high-temperature setting for coarse or thick hair and low-temperature settings for thin hair. But Calista MagicStyler hot rollers set has no option of variable temperature settings. With his hot roller set, you can only have one built-in temperature that is fixed for every hair type. If you have thin hair then excessive heat may burn your hair and if you have coarse hair then during to less heat your curls may fall. So in line with your hair type, you need different temperature settings that you cannot get with these hot rollers. This hot roller set by Calista do not have dual voltage settings which mean it only operates single voltage of 110V. If you have two homes or if you love traveling then you cannot take this hot roller set with you. If you like the features of this tool then you will have to buy two different hot rollers set for your two home. If you travel much then you should not purchase this hot roller set because you cannot use this out of the USA. If you try to use it with an adapter, your device will be entirely destroyed. The MagicStylers hot roller set by Calista bears rollers that are weighty and tough to bear. The roller set may seem tough to carry or to travel with. Even the rollers are also heavy and it becomes difficult for your hair to take the immensity. No matter if you pin clips on your hair or not, your hair will fall down for the excessive weight of rollers. 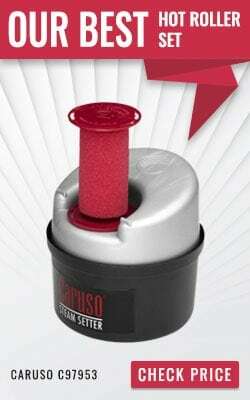 The curls made by Calista MagicStylers hot rollers are not long-lasting. The heat that the rollers of this set provide is too less to hold curls. The rollers do not get enough hot to give you proper coils and you after some time your curls will start to fall. The MagicStylers Hot Rollers by Calista is not perfect for coarse or thick hair. The rollers cannot hold coarse or thick hair and as the rollers do not get enough you will find the hot rollers tough to made proper curls for you. If you have coarse or thick hair then no matter what diameter you choose for your desired curls, you will end up making loose waves or adding a little volume. Calista has flopped in the manufacture of Magic Stylers Heated Rollers as it has some depraved negative phases such as the absence of the PTC heater, the absence of dual heating settings and having only one roller size. This hot roller was designed for medium hair. If you want to try Calista for your medium hair then you can go for Calista Tools ION Hot Rollers (Short-Style Set) because it has 12 rollers including six 1 ¼ Inch rollers for medium hair.